Two summers ago I split a farm share with a friend. One week there was a rutabaga. 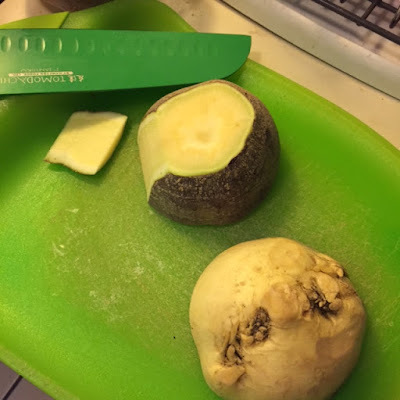 What is a rutabaga, besides a funny word? I had no idea. So it sat in my fridge for a couple weeks until it started to shrivel and then I tossed it out thinking I'd never see one again. Cut to Sunday afternoon when a friend of mine was in VT for the weekend and asked if I wanted to pick up her farm share since she wouldn't be home. Free veggies?! Go ahead and twist my arm. Peppers, butternut squash, kale, lettuce, parsnips, potatoes, leeks... rutabaga. Oy. 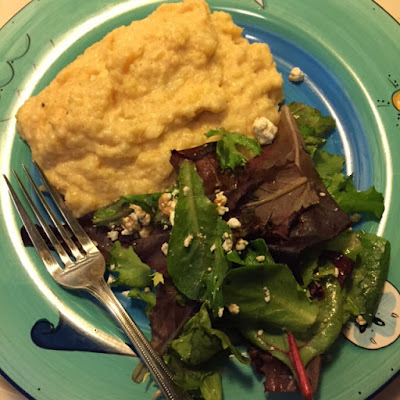 Me: What do I do with rutabaga? Cara: Put it in your fridge for two weeks then throw it out. 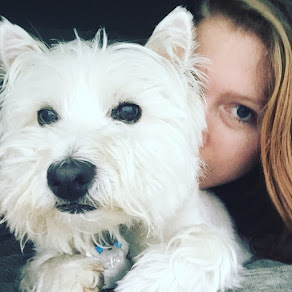 Cara: Let me know if something creative happens. So last night, with my mother coming over for dinner, I asked if she'd be willing to try it with me. Since she has no ability to taste (aside from salt, sweet, spice), she was absolutely willing. 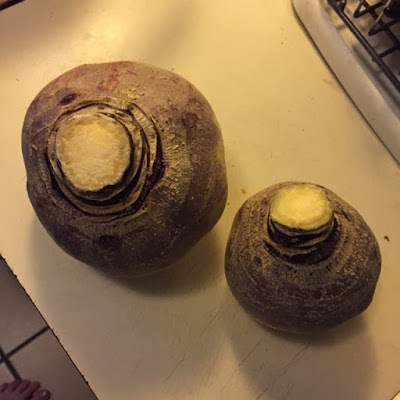 So I did a little online research and apparently rutabaga is a lot like potatoes. You can roast it or mash it or add it to a soup, so I thought, okay, I can totally do this. After eating the finished product I was thinking how adding a little bit of a shredded, smoked cheese, maybe Gruyere or Gouda would just knock this out of the park. Ok, so. Cut the rutabagas in half so that when you peel them they rest evenly on your cutting board, which will make it much easier (and safer). Then with your knife, cut the outside peel off, working your way around the exterior. 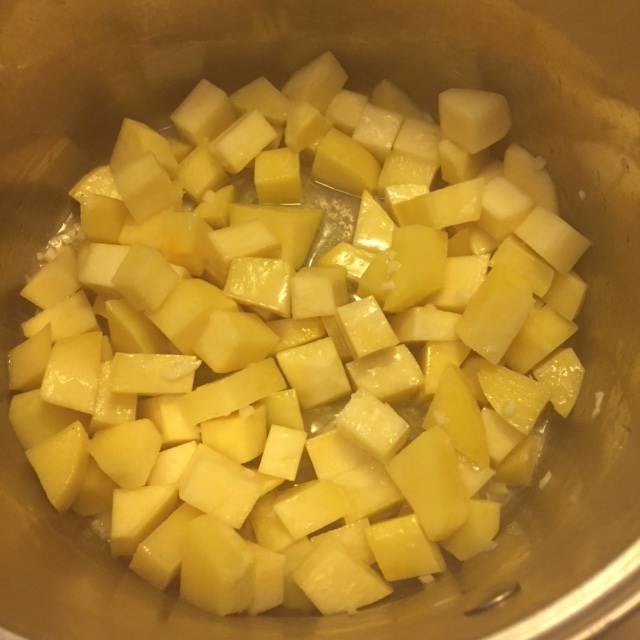 Then cut the rutabaga into small chunks (the smaller the chunks the quicker they will cook). 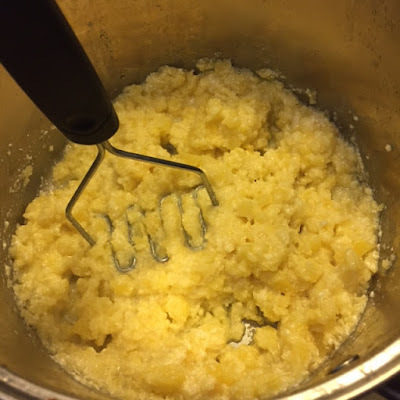 Over medium heat, melt the butter, then add in the rutabaga and your garlic. When chopping the garlic, keep in mind that your guests may not want to bite into a big ole chunk of garlic (unless the guest is my father) so I always go with the smaller the chop the better. Pretty good rule of thumb. Cook for a minute or two then add the salt and milk. Turn temp to low and cover. Cook until the rutabaga is easily pierced with a fork, about 20-25 minutes. The softer the rutabaga, the easier to mash. Remove the pot from the heat and mash the rutabaga. Much like with mashed potatoes, you can certainly add more butter (I went with a little drizzle of olive oil). You can mash them as much or as little as you like. 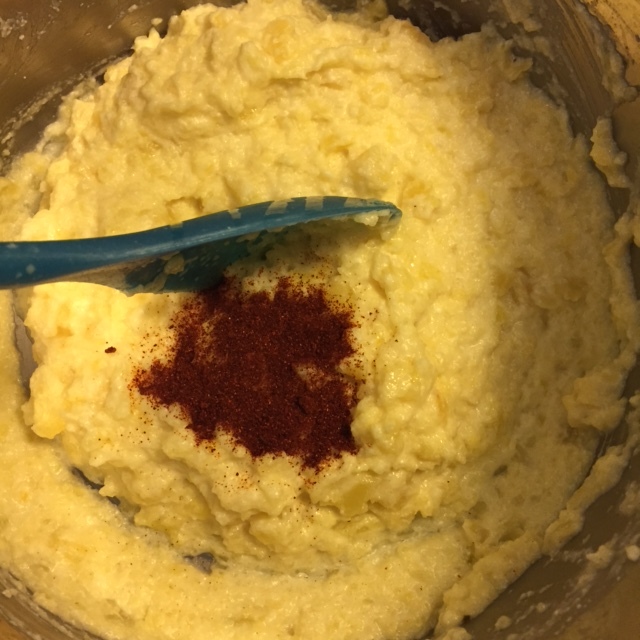 Then add in cream cheese and smoked paprika (and cheese if you so desire). 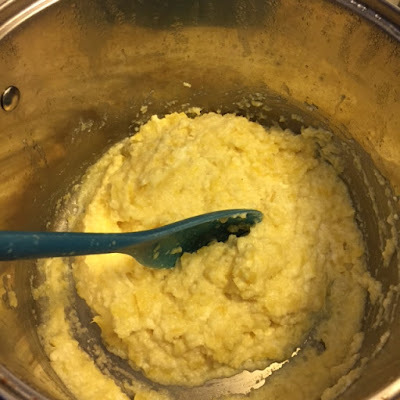 The final product is reminiscent of mashed potatoes but with a slightly different, sweeter flavor. And with Thanksgiving around the corner, I would seriously think about adding a rutabaga dish to your holiday spread. Try something new! And if you need a little incentive, rutabagas are high in Vitamin-C, are full of antioxidants and anti-cancer properties. They are also a good source for fiber, potassium, manganese and calcium. So, basically, you should add them to your diet. And anyways, they're just really fun to say. Rutabaga.